I work hard to get the taste right for the ingredients I don't like otherwise. Mutton Liver was one such organ meat I never could develop my taste for in the initial days of my non vegetarianism. Later when I realised that Arvind needed to eat mutton Liver frequently, I was petrified to think of the awful smell it emanates while cooking. He would ask me just to fry in salt n pepper with ghee as he loved it this way. A couple of times with the simple salt n pepper Liver fry and I was off with it for ever. Couldn't develop a taste for it, although many of our friends declared that was their favorite way to enjoy any organ meat. I digressed, naturally towards the more flavorful versions of Liver curry. I am happy I did. Many yummy discoveries were made and mutton Liver is no more a horror.. 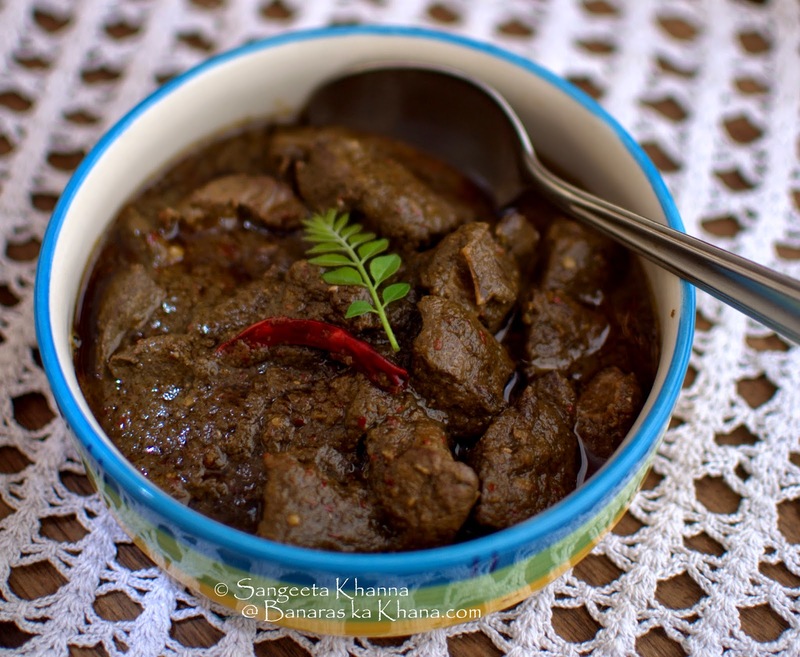 I prefer cooking mutton Liver in a wet gravy or with watery vegetables and not a dry stir fry in ghee or oil. One with pumpkin and a lot of red chilly powder with a tempering of Nigella seeds is quite a favorite.The water content of the vegetables keep the Liver moist even when it cooks for a bit longer, which I prefer as I don't like a reddish flesh inside while biting into it. So this curry was made in a jiffy, a few ingredients were made into a coarse paste and dunked into oil. Added the Liver after a while and cooked some more. That's it. Make the paste number one, a coarse paste is intended, so don't worry to make it too smooth. Empty the blender directly into the pan and then blend the tomato in the same without rinsing. Use as directed. Heat the oil in a kadhai and tip in the first paste that was made. Stir a few times for a couple of minutes till the oils comes on top. No need to add water. Now add the tomato paste too and along with it the Liver pieces. Mix well and cook covered for 10 minutes on low flame. This is something worth repeating every week. A complex heat from red chillies, black pepper corns and ginger, a complex sourness from tomatoes and tamarind used together and the aromatic curry patta. The flavors are sealed. 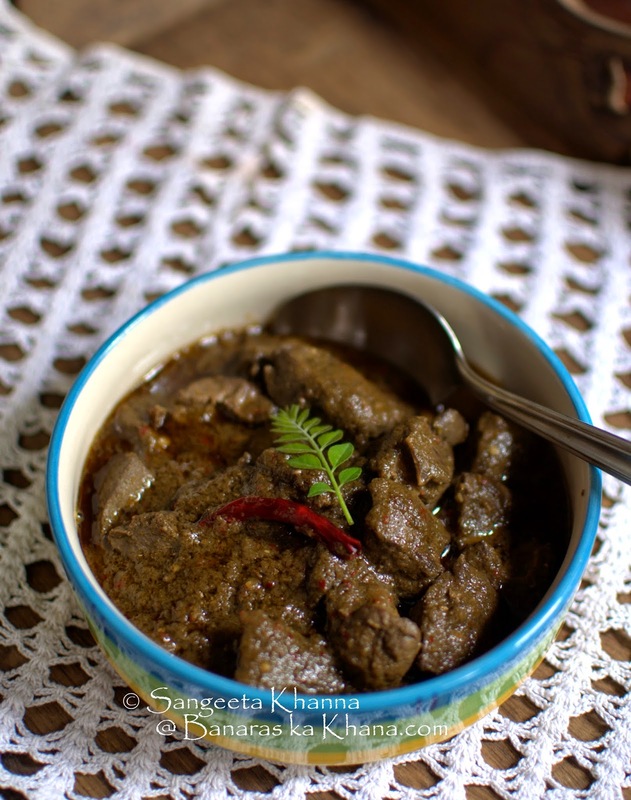 This Liver fry with Curry patta is good too if you want to have a dry stir fry with mutton Liver. This tangy and hot curry was something I would recommend when you have the fresh curry patta, some Shallots and Tamarind at hand. Any ingredient substituted and you miss the flavors.I am wondering how a vegetarian curry would taste with this quick gravy. May be some soy nuggets or tofu or simply poatoes?